​​the first woman to engrave as well as draw plants. ​An introduction to Elizabeth Blackwell and "A Curious Herbal"
hand colour colour her own designs. ​This saved her the expense of hiring a professional engraver! 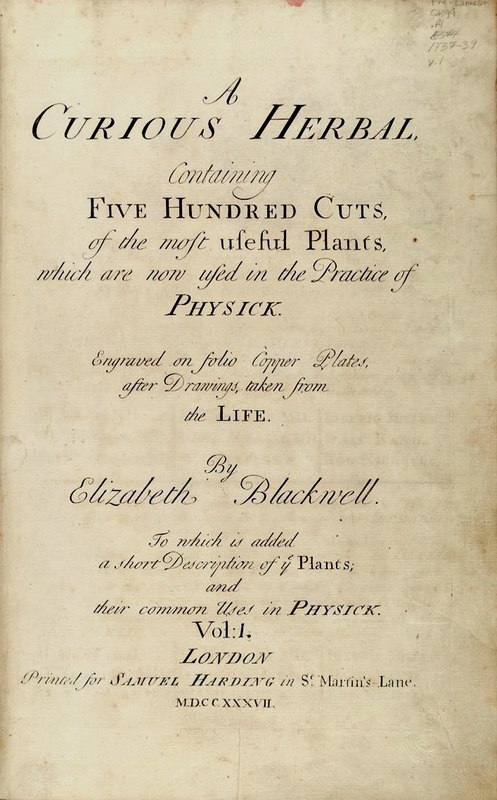 Blackwell is also notable for her publication "A Curious Herbal" in 1735. Blackwell compiled and published her hand drawn, engraved and coloured Herbal in order to raise funds to free her husband from debtors prison. links to biographies and books about her life and work. Plus online galleries and exhibitions which display her work. Elizabeth Blackwell (nee Blachrie) was among the first women to achieve fame as a botanical illustrator. She was born Elizabeth Blachrie in Aberdeen in the early 1700s (there is disagreement about the date) and was the daughter of a successful merchant. She married her second cousin Alexander Blackwell when she was 27. Her husband seemed to have a talent for being involved in dodgy business practices. He practised as a phsyisican - but had no medial training. They fled to live in London when this was called into challenge. Elizabeth Blackwell undertook an ambitious project to raise money to pay her husband's debts and release him from debtors' prison. Her project was a book called A Curious Herbal. She learned that a physicians required a reference book which documented the medicinal qualities of plants and herbs AND included illustrations so it could be used to identify the plants. Prior to her Herbal no such herbal existed in England. In order to develop the illustrations for the Herbal she examined and drew specimens of plants available in the Chelsea Physic Garden. She also produced the botanical engravings and hand coloured them. She lived at 4 Swan Walk while drawing plants in the Physic Garden. Her children, William and Ann, both died in 1736, soon after she commenced work. Her husband's role in the project was to provide the scientific nomenclature and common names of the plants in various languages and what they could be used for. 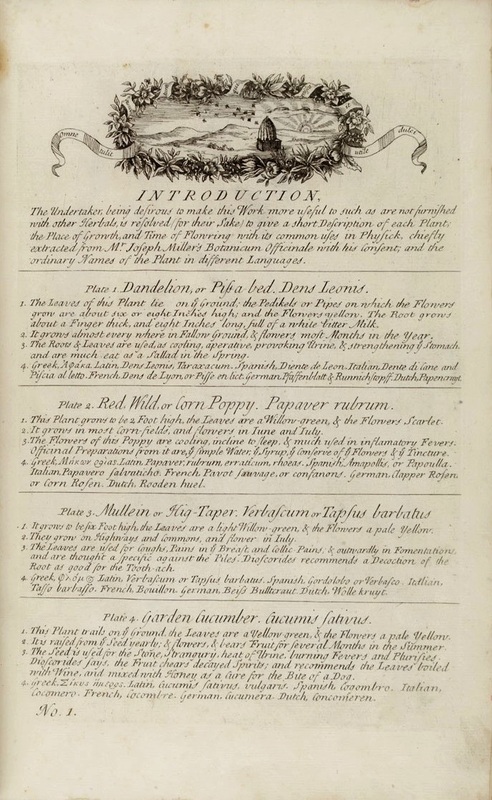 Sir Hans Sloane provided financial support to publish 'A Curious Herbal'. In total, the enterprise took Blackwell six full years to complete. She was able to release her husband from prison. Her husband emigrated to Sweden. He continued his 'career' by becoming involved in a a conspiracy to alter the Swedish succession and, as a result, was beheaded on 29 July 1747. Elizabeth continued to live in Swan Walk until her death in 1758. Her grave is in the churchyard at Chelsea Old Church and she is one of the four names on a plaque in Chelsea Old Church dedicated to the memory of Chelsea women distinguished by their learning and piety. Note: In researching Elizabeth Blackwell please note she is NOT to be confused with the medical practitioner of the same name who was the first woman in America to receive a medical degree. They are different people with different dates. 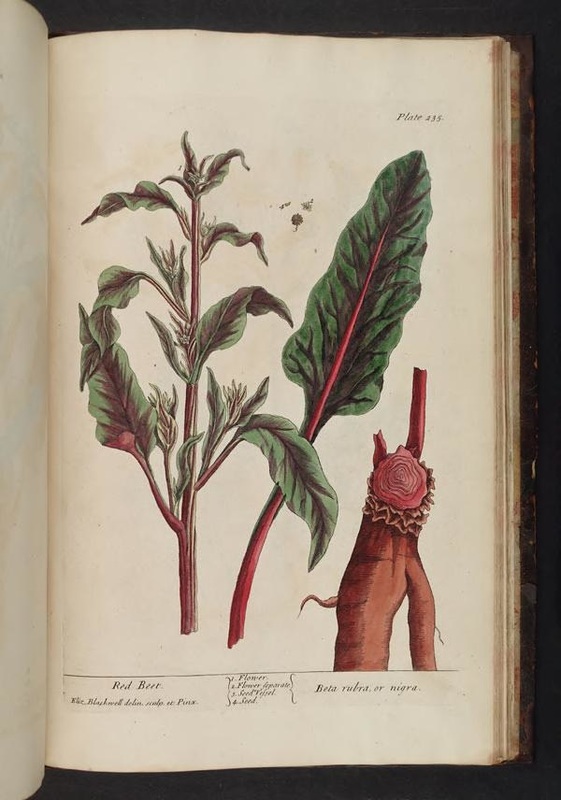 RECOMMENDED: Elizabeth Blackwell's 'A Curious Herbal' | British Library - The Story of Elizabeth Blackwell and how she came to create "A Curious Herbal" with its beautiful illustrations of medicinal plants. Will the Real Elizabeth Blackwell Please Stand Up? 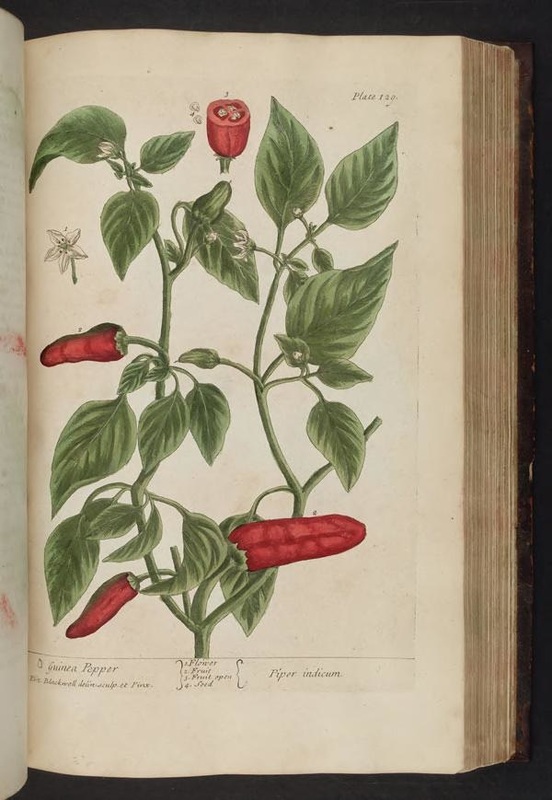 | New York Botanical GardenThe extraordinary story of this talented Englishwoman and botanical artist, Elizabeth Blackwell (c. 1700-1758), is part of the Herbals exhibit now on display in the Rondina and LoFaro Gallery of the NYBG’s Mertz Library. Chelsea - Swan Walk | Royal Borough of Kensington & Chelsea - highlights her connection to 4 Swan Walk and her grave in Chelsea Old Church. Blackwell's book is notable both for its beautiful illustrations and for the unusual circumstances of its creation. A curious herbal: containing five hundred cuts, of the most useful plants, which are now used in the practice of physick engraved on folio copper plates, after drawings taken from the life / by Elizabeth Blackwell. To which is added a short description of ye plants and their common uses in physick. The first herbal was written by the Greek physician Dioscorides in the first century AD. A Curious Herbal was well received by physicians and apothecaries for its scientific detail and accuracy. Blackwell's Herbal was an unprecedented enterprise for a woman of her time. Each part containing four illustrated plates and a page of text. It was highly praised by leading physicians and apothecaries (makers and sellers of medicines), and made enough money to secure her husband's freedom. 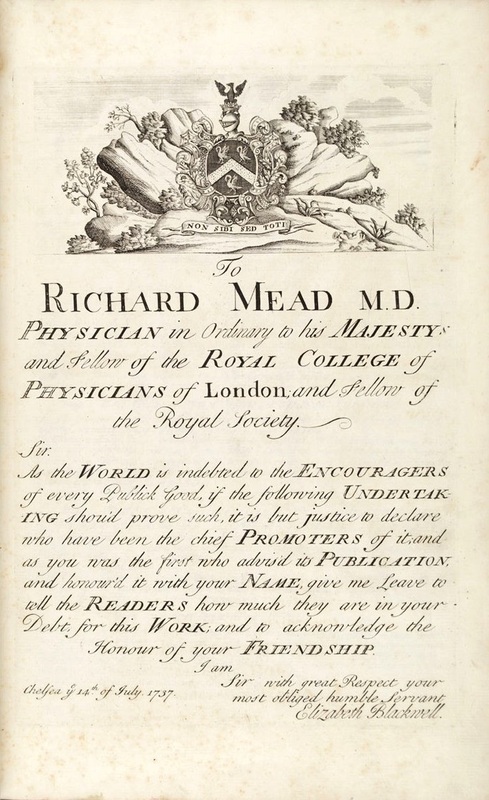 A Curious Herbal was published between 1737 and 1739. This is because the final work, containing 500 illustrations was published in 125 weekly instalments. The book contained the first illustrations of many odd-looking, unknown plants from the New World. 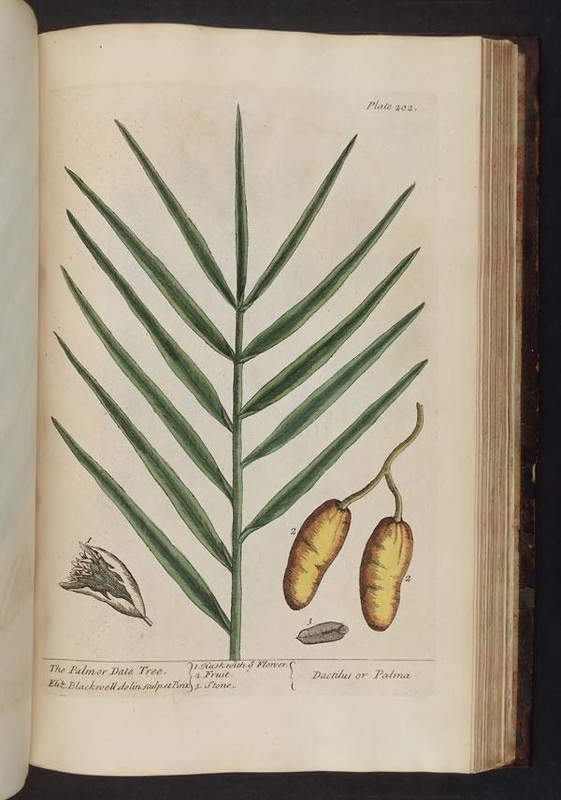 MAKING A MARK: Botanical Artists: Elizabeth Blackwell and 'A Curious Herbal' - Elizabeth Blackwell was the first British woman to produce a 'herbal' and the first woman to engrave as well as draw plants. 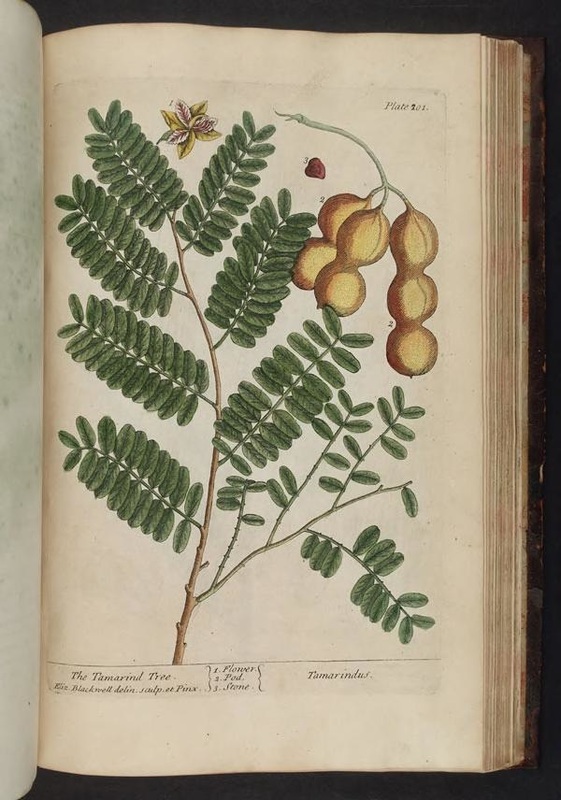 A curious herbal | Biodiversity Heritage Library The Biodiversity Heritage Library works collaboratively to make biodiversity literature openly available to the world as part of a global biodiversity community. Download their copy of "A Curious Herbal"
​Elizabeth Blackwell's illustrations for her Herbarium, edition published by Christoph Jacob Trew Antique natural history prints by Elizabeth Blackwell from Christopher Jacob Trew's edition of Herbarium Blackwellianum. These German-edition natural history etchings and engravings were hand colored at the time of publication. This is where the plants came from which were included in "A Curious Herbal". 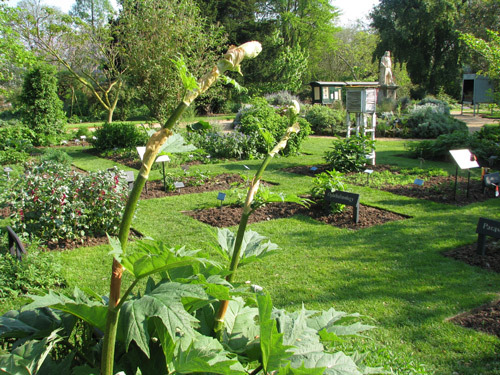 ​Today the Chelsea Physic Garden has its own Florilegium Society.